The status conference was held on 8th October 2014. 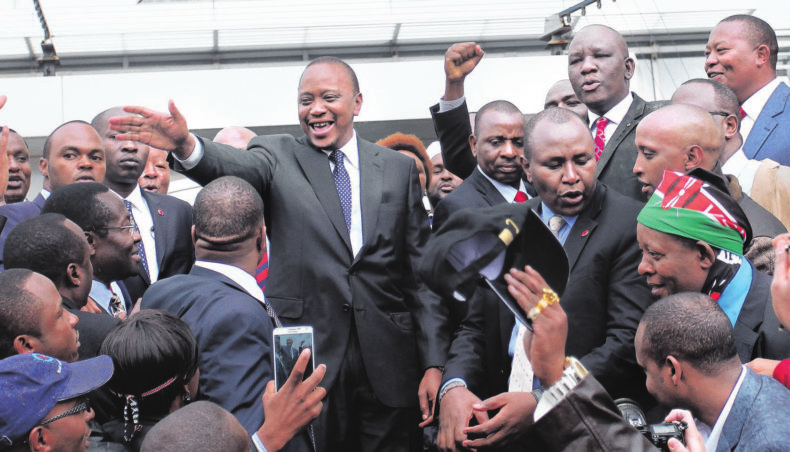 Kenya's President Uhuru Kenyatta was in attendance after obeying summons by the court. See the videos for the conference held on both the 7th and 8th October 2014. The following a summary of the case progression thus far as posted on the ICC website. Accused of five counts of crimes against humanity in the context of the 2007-2008 post-election violence in Kenya. other inhumane acts (article 7(l)(k)). On 5 November 2009, the ICC Prosecutor notified the President of the Court of his intention to submit a request for the authorisation to start an investigation into the situation in Kenya pursuant to article 15(3) of the Rome Statute, about the 2007-2008 post-election violence in Kenya in which around 1,300 people were allegedly killed. On 6 November 2009, the Presidency of the Court assigned the situation to Pre-Trial Chamber II, composed of Judge Ekaterina Trendafilova (presiding judge), Judge Hans-Peter Kaul and Judge Cuno Tarfusser. On 15 December 2010, the ICC Prosecutor requested Pre-Trial Chamber II of the ICC to issue summonses to appear for six Kenyans on the basis that there existed reasonable grounds to believe that they were criminally responsible for crimes against humanity. On 8 March 2011, Pre-Trial Chamber II, by majority, issued the decisions on the applications submitted by the Prosecutor and summoned Francis Kirimi Muthaura, Uhuru Muigai Kenyatta and Mohammed Hussein Ali to appear before the Court. On 31 March 2011, the Government of Kenya filed an application challenging the admissibility of the case before the ICC. On 30 May 2011, Pre-Trial Chamber II rejected this application. Pre-Trial Chamber II’s decision was confirmed, on 30 August 2011, by the Appeals Chamber. At the initial appearance hearing, which took place on 8 April 2011, the Chamber scheduled the confirmation of charges hearing in this case for 21 September 2011. The confirmation of charges hearing was held from 21 September to 5 October 2011. On 23 January 2011, the Judges declined to confirm the charges against Mr Ali. Pre-Trial Chamber II confirmed the charges against Mr Muthaura and Mr Kenyatta and committed them to trial before an ICC Trial Chamber. On 18 March 2013, the charges against Francis Kirimi Muthaura were withdrawn. On 23 January 2014, Trial Chamber V(b) vacated the trial commencement date of 5 February 2014 in the case of The Prosecutor v. Uhuru Muigai Kenyatta. On 19 September 2014, Trial Chamber V(b) vacated the trial commencement date in the case The Prosecutor v. Uhuru Muigai Kenyatta, which had been provisionally scheduled for 7 October 2014. Prosecution's Notice of 5 September 2014, respectively The defendant is not in the custody of the Court. 725 victims are participating in proceedings in the Kenyatta case and are represented by Fergal Gaynor.